Directions for use: Adults and children aged 14 and over: Use an amount the size of a one penny or two penny piece and rub gently into the skin over the affected site. Apply 3 - 4 times daily to the affected area of skin. Do not use for more than 7 days, unless longer treatment is recommended by a doctor. Do not exceed the stated dose. Wash hands after use (unless they are the site being treated). 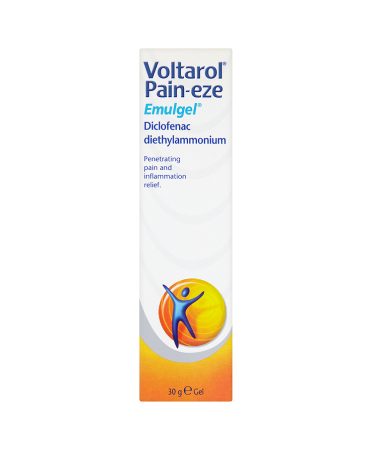 Voltarol Pain-eze Emulgel is for the local symptomatic relief of pain and inflammation caused by rheumatic, or muscular pain, sprains, strains and bruises eg due to sports injuries. It penetrates the skin to bring direct relief to the affected area. Not for use on children under 14 years. If symptoms worsen or persist for longer than 7 days, consult your doctor. Keep all medicines out of reach and sight of children. Before use, read the enclosed leaflet carefully. Do not use if you are allergic to, or ever had an asthma attack, wheezing, urticaria (hives), or a runny nose after taking aspirin or other NSAID pain/anti-inflammatory medicine, or if you are sensitive to diclofenac or any other ingredient of the gel. Do not use if you are pregnant or breastfeeding. 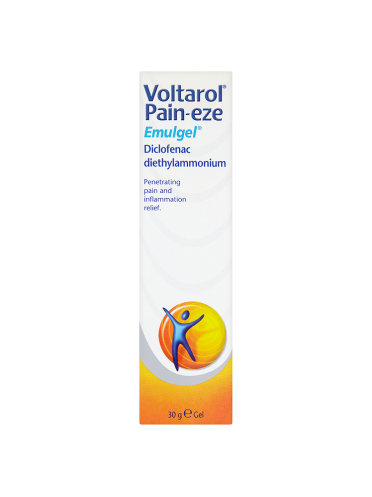 Do not use if you are taking oral diclofenac, aspirin, ibuprofen or other NSAID medicines. Consult your doctor or pharmacist before using if you suffer from asthma, have ever had a stomach or duodenal ulcer, or are taking any prescribed medicines. Do not apply to cuts, wounds, sunburned skin or other area where the skin is abnormal, or near the eyes or nasal area. Do not cover with a bandage or plaster. When using for the first time, reverse the cap, engage with the nozzle, twist and remove the seal from the tube. Do not use if seal is broken.